To all of you holding out hope that there would be a solid For Honor and Assassin’s Creed crossover of some sorts, it is time to let you know that your patience has been awarded. As of right now, it looks like Ubisoft is running a nice long event to give all of you just that in the game. More than just having the one assassin character and templar character that was loosely fitting for those character types before. 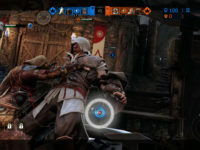 No, this new event for For Honor will be bringing in not only the look of the AC games, but also some of the moves, kills, and characters to take down as well. It all seems like it is a bit far out given when For Honor released, but it is currently available for all players of the game for free and will run until January 10th. As long as you want to pretend that your game’s world is set in the Animus now and see how some of the weirder animations mix into the game. That and have the chance to take down Ezio or Cesare Borgia depending on which side you are on in the special version of the Dominion mode. That is how you will be playing with these new things in For Honor. At least it is more than just having the symbols thrown around and basic characters to pretend they are all in the same universe here. Assassins and Templars are coming to For Honor for a special three-week event titled For The Creed. Fight inside an Animus simulation, perform hidden blade assassinations, leap into conveniently placed bales of hay, and unlock exclusive Assassin’s Creed-themed gear and weapons from December 20 through January 10 on all platforms. Is this the update and event for For Honor that you have been waiting for or does it seem like it took too long to finally get out there? Do you think that some of these animations and moves are a bit weird for the game here or just the right level of weird to mix in well? Were you hoping to be able to play as the Ezio or Cesare in the matches or does it all fit what you imagined it to be? Let everyone know what you are thinking down in the comments and then feel free to discuss. If there is more of an update to For Honor, we will bring it to you here. Just be around so you do not miss it.